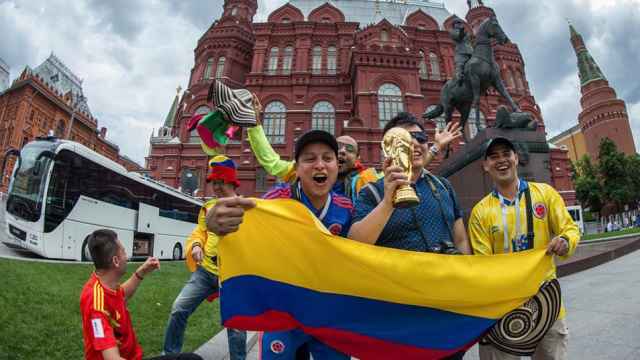 Having last recorded a World Cup victory in 1998, the thousands of Iranian fans who have traveled to Russia to get behind their team are cheering more in hope than expectation. But for the Iranian women in their contingent, just being there holds a far greater significance. For them, simply taking their places inside the stadiums is worth as much as a victory itself. Football may be Iran’s national sport, but you have to go back to the Tehran derby of Oct. 5, 1981, to find the last time the country’s female supporters were allowed to watch it live. Ever since football began to gain popularity in Iran in the early 20th century, men and women had mingled freely on the terraces during Iranian league matches. But after the Iranian revolution of 1979, everything changed. “Since Iran became an Islamic state, there have been two important things for the government: opposing Israel, and enforcing restrictions on women such as the hijab and banning them from watching sporting matches involving men,” said Afsane, a 28-year-old from Isfahan with tickets to see Iran’s clash with Spain. In the past few years, women’s access to football has increasingly become a highly charged political issue in Iran. Hundreds of female fans demonstrated outside stadiums during Iran’s World Cup qualifying matches and recent international friendlies, demanding that the law be changed, while women across the country have risked often brutal punishment by stealthily sneaking into stadiums disguised as men. Yet the Iranian regime has shown little sign of changing its stance. The mere presence of Iranian female fans in stadiums across Russia is a tense subject back home. Even though the World Cup is taking places thousands of kilometers from Iran, the mere presence of Iranian female fans in stadiums across Russia is a tense subject back home. Four years ago, photos of Iranian women at the Brazilian World Cup not wearing the hijab sparked a furor when they went viral on social media, with Islamic hardliners expressing anger that they were clad in Western clothing. Iranian women traveling to the World Cup this year were warned by parliamentary officials to avoid actions not deemed compatible with the values of the Islamic republic, while Iranian television coverage of the games is heavily censored. 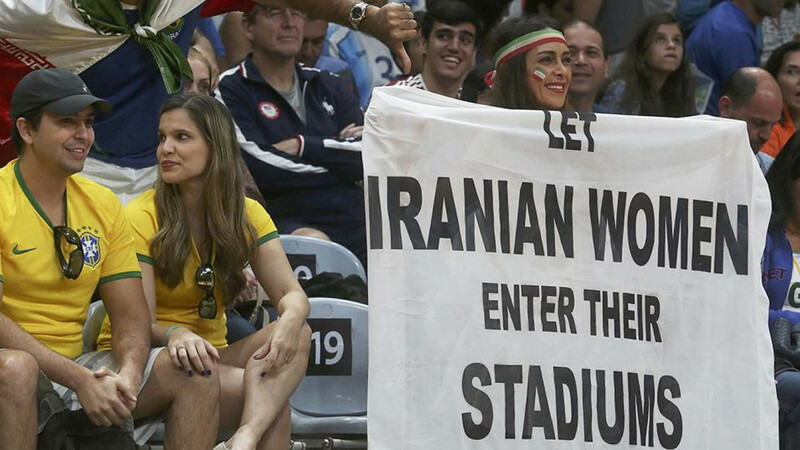 In advance of the games, however, some Iranian female fans were secretly planning T-shirts and banners emblazoned with messages protesting against the stadium ban back home. And during Iran’s opening match against Morocco, some of the activists held signs against the policy. They hope the messages will attract international television coverage during Iran’s matches, and encourage FIFA to apply further pressure to the government to change its laws. Indeed, in March, FIFA president Gianni Infantino directly appealed to Iranian president Hassan Rouhani to reverse the ban. However, even the smallest of protests come with certain risks. The women are well aware that their presence in Russia is being closely monitored by the Iranian officials who have traveled there too. But by being able to travel to Russia, Afsane and Sarvenaze say they are among the fortunate ones. Married women in Iran are unable to travel abroad unless they receive their husband’s permission, while single women under 40 can have their passports taken away if their fathers object. While a handful of the Iranian female supporters in Russia have traveled outside the country to watch matches in the past, most are experiencing live football for the very first time. Many are of a generation who were first introduced to the sport two decades ago through the France 1998 World Cup, Iran’s first appearance at the tournament since the 1970s, a spectacle that was celebrated throughout the nation. 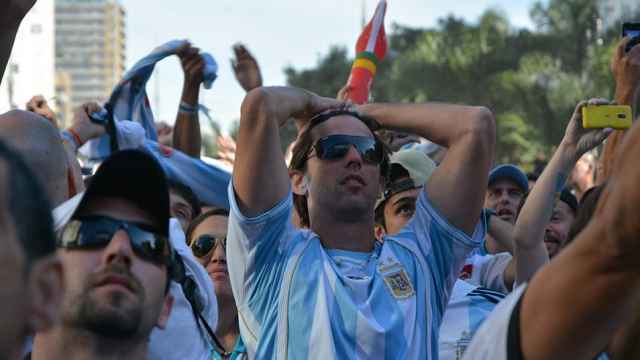 But while their emotions are a mix of triumph and relief at finally being able to claim what they describe as a basic human right — holding a ticket to watch a sport that they love — there is a lingering sense of sadness that it’s taken so long to be able to watch the teams they grew up admiring.